Many years ago, humans invented the wheel. Then one day they invented the app. 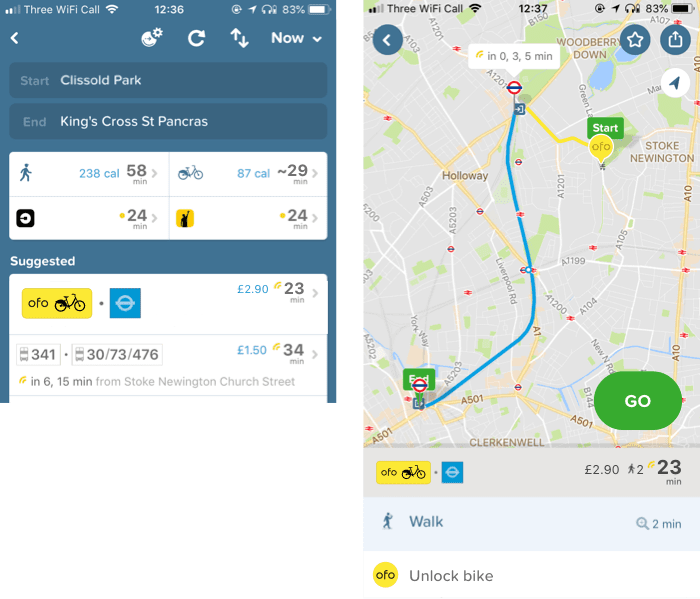 Now you need apps to use wheels..
Our mission has been to build the ultimate urban transport app and make cities easier to use. We’ve helped people understand the fixed transport infrastructure of their cities. But the times, they are a-changin’. The new transportation is floating, it has no set stops or infrastructure, and it’s filling a mobility gap in our cities. 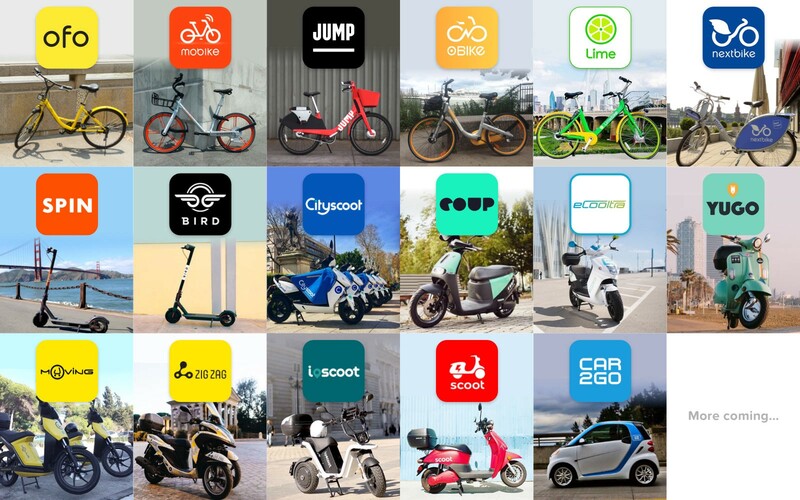 We’ve begun integrating the new modes of transport into our app: the cycles, the scooters, the mopeds, the thingamajigs.. side by side with all existing fixed urban transportation. Floating transport will complement fixed transport to generate new A to B options across cities, improving travel times and increasing access to mobility. From Europe to the US to Asia. 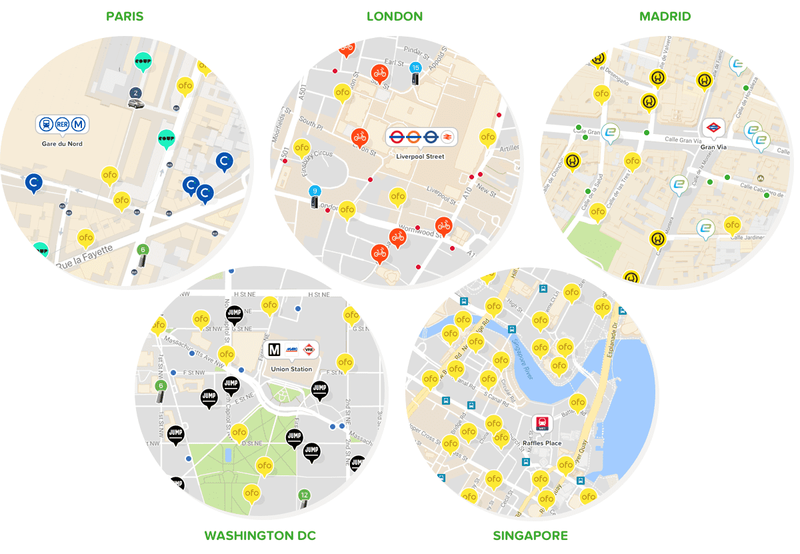 We’re fascinated by how quickly all these providers are changing mobility behaviour in cities. And intrigued by how different solutions are succeeding in different cities. It’s worth understanding the floating landscape. There are also floating cars, e.g. 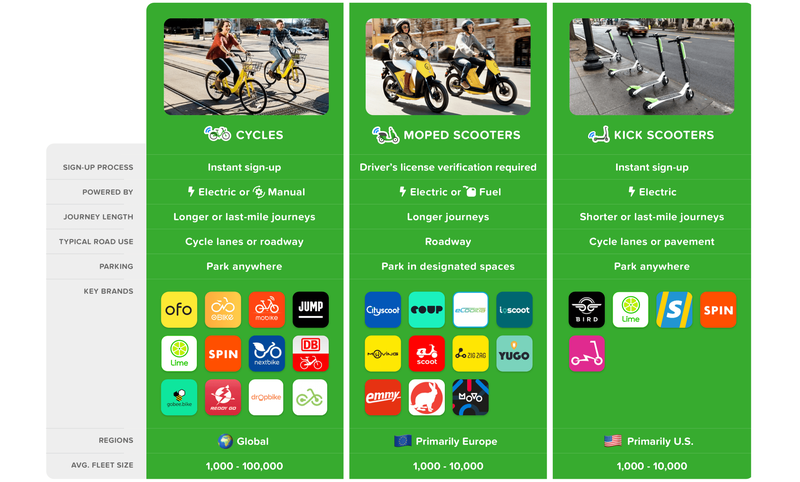 Car2Go, DriveNow, etc, but we’ll leave them out of this busy chart for now. Some modes require licenses, some don’t. Some are electric, others aren’t. Some can use cycle lanes, some only roadways. Some can be parked anywhere, others have designated spots. It’s survival of the fittest! The traditional transport system has been designed by people sitting in an office. Stations are fixed. Bus stops are fixed. Once set, they don’t change very often. Stability and predictability is important of course, so they need to exist. But the city is an organism that changes day by day. Floating transport can respond more quickly and evolve with it. This creates a change in the fundamental question for apps to solve. With fixed transport it’s been ‘when’, i.e. “when is the bus coming?”. Now it’s ‘where’, i.e. “where is the nearest kick scooter/cycle/moped?”. Our app solves this, and will evolve to support this even better. Recent data indicates an alarming trend: a reduction in general mobility in our major cities. Some blame remote working and online shopping, i.e. people are able to do more at home: work, shop and entertain themselves. This is particularly the case when mobility options are insufficient. Floating transport is cheaper infrastructure, and thus can more easily expand coverage to parts of the city with fewer options. Public transport has had a monopoly. Now users will have plenty of additional private options and will pick the winners. We will evolve our app to support user behaviours. 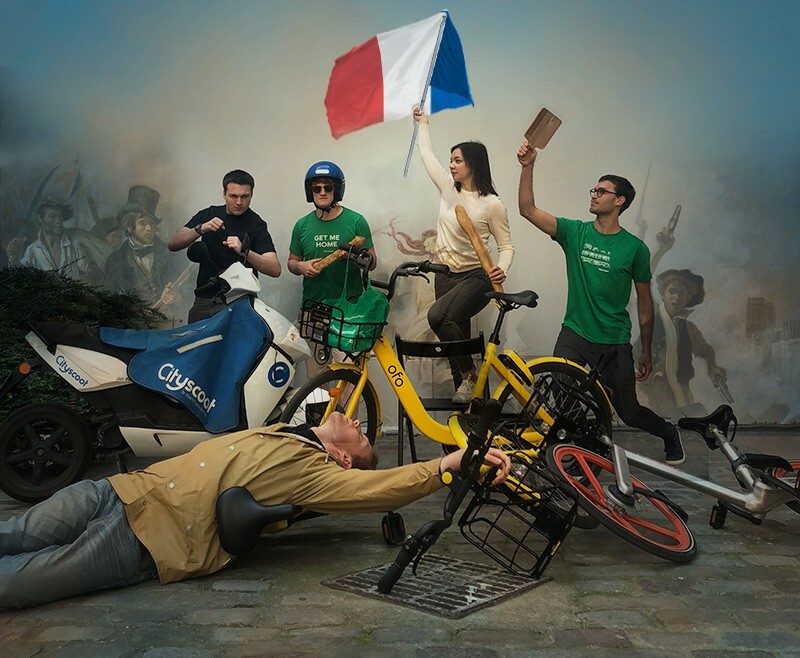 For example, in Paris we find Autolib (car sharing, near bankruptcy) and Velib (shared docked bikes, functionality has gotten worse) in decline, while floating transport compensates, so we will adjust accordingly. With fixed transport, the regulation has often driven the operator, with the operator then guiding the users. Now the relationship gets flipped. The users will drive the operators, i.e. the new brands will respond rapidly to demand in order to survive. The regulators will accelerate to cope with all the new operators and services. You’ve seen the pictures. ‘Floating transport is going to invade our streets and ruin the feng shui!’ Wish we would apply the same critical mindset to carbon polluting parked and single occupancy cars. Technology is capable of solving these problems. Floating transport can mimic docked parking. Geolocation technology and app design can motivate favourable behaviours from users. It will be interesting to see whether private companies solve this themselves, or require regulation. And whether this influences how our cities are designed. Floating transport can solve the last mile problem of public transport, and thus enhance the use of existing infrastructure. If the trip to the local train station goes from a 15 min walk to a 5 min scooter ride, then it improves access. And could help public transport further compete with car ownership. This means all the A to B routing combinations across our cities are evolving. Thankfully, we have a multimodal routing algorithm that combines cycles with public transportation. We will use it to show relevant users multimodal trips across the city, improving travel times and increasing access to mobility. This is not easy. We’re combining fixed routes with floating (i.e. ever-changing) routes. This creates an infinite number of A to B routing options, and we will give you the best ones every time. As you may know, we’ve been trying to reinvent the future of shared transport / minibus systems. Should stops be fixed, so that they are predictable? Or should they float, and be responsive to a city? Should we spend on fixed stop infrastructure that ties us down, or let infrastructure evolve with a city? We will report further on this another day.. 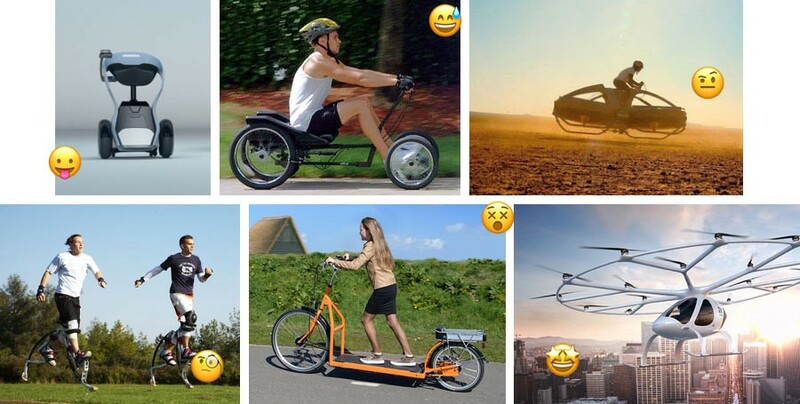 But these are surely interesting times in urban mobility. It’s the age of floating transport. Embrace it. Ignore it. Love it. Hate it. But it’s here.